Australia Prime Minister Julia Gillard gave a pointed speech--in every sense of the word--in October in her nation's parliament, and it took off like a rocket. As of this week, that number climbed even higher, to close to 2 million views of the speech on YouTube alone. For perspective, that puts Gillard's speech--in little more than a week--at the level of the most-watched TED talks in a given year. The Leader of the Opposition says that people who hold sexist views and who are misogynists are not appropriate for high office. Well I hope the Leader of the Opposition has got a piece of paper and he is writing out his resignation. Because if he wants to know what misogyny looks like in modern Australia, he doesn't need a motion in the House of Representatives, he needs a mirror. That's what he needs. On occasion, pointing works: Nine times out of 10, I'll tell you that pointing with a single finger is considered among the most potent and offensive gestures a speaker can use, in almost every culture--and so I'll counsel you to use other options. In this parliamentary setting, however, it works. 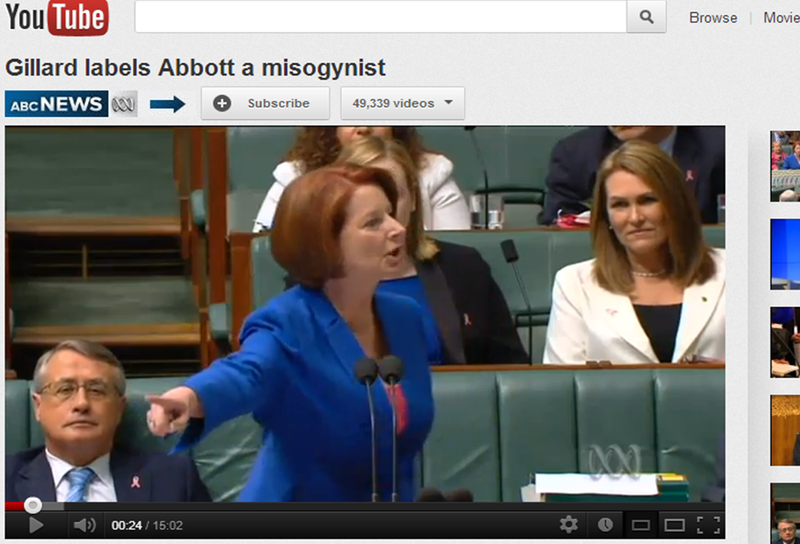 You can see how it adds to the volume, drama and anger in Gillard's remarks, helping to visually put Abbott's words back on him as the speaker does the same. A well-rehearsed speech should still take advantage of the moment: You can see Gillard referring to her notes before her in what appears to be a well-practiced, well-scripted diatribe. But she has an eye on her audience and on Abbott, so she's able to work in one of the best lines of the day: "Now he is looking at his watch because apparently a woman's spoken too long." Substantive arguments must underpin a salvo like this: This isn't just strong emotion and personal attack. Gillard's remarks include at beginning, middle and end several reminders of the parliamentary action at hand, and spell out her opposition on concrete terms, such as awaiting the outcome of a judicial action before parliamentary action is taken. They make her argument stronger, and the personal criticisms become the icing on the cake. Together, it's a potent combination. Less well known: Gillard's commentary mirrors actual research about how women's speaking is perceived and shut down by men. It rings true, even if you don't know about the statistical significance of her words. When someone's projecting on you, put it back where it belongs: This happens all the time in the workplace, and Gillard's spirited effort to reverse the projected suggestion that she's a sexist does the job perfectly. Her suggestion that the opposition leader "needs a mirror" is an overt reference to this. Keep that in mind the next time the office gossip accuses you of gossiping you haven't done, for example, and fire back with a "but I was just thinking the same thing about you." While cheered the world over, the speech was not universally loved, and Gillard was said to have "played the gender card," suggesting that she did so only for cheap effect and unwarranted sympathy. The New York Times has a good summary of the sexist comments made to and about the prime minister here, for background reading before you watch this speech. 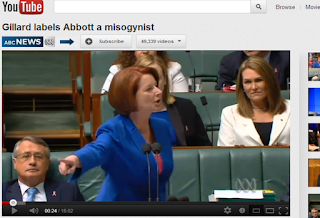 You can read a transcript of Gillard's remarks here, and watch the speech below. And if you want a key to the times in the video where the most-noted lines occur, Upworthy has that for you. What do you think of this famous speech? Special thanks to Claire Duffy for sharing links and Aussie perspective on this post. The speech was great. Watching the Canberra press gallery making excuses for missing it's significance, as they have missed pretty much every significant event for the last 5 years, was the icing on the cake.